Angry Birds Go! 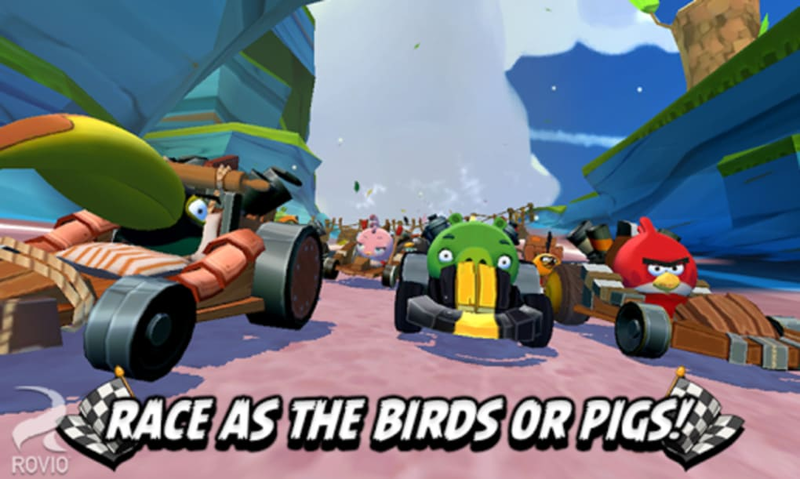 is a Mario Kart-style racing game featuring the characters from the popular Angry Birds series of games. Angry Birds Go! is a completely different kind of game than we're used to from Rovio's feathered heros. Previous titles like the original Angry Birds, Angry Birds Seasons, and Angry Birds Star Wars have all be strictly based around catapulting birds into heavy objects. 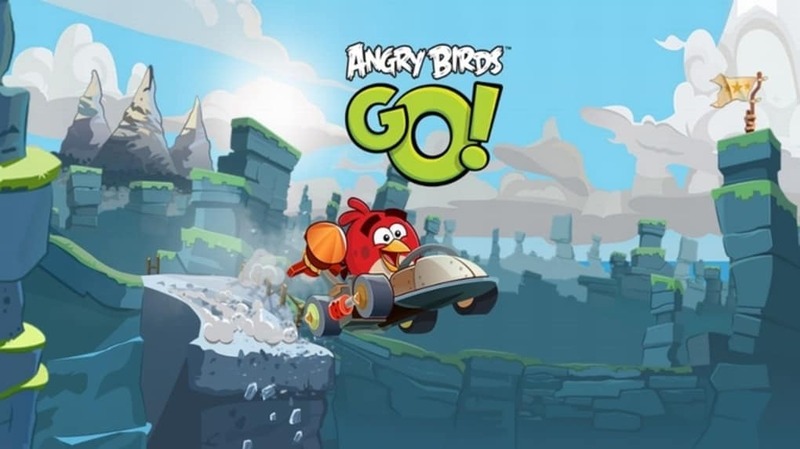 Angry Birds Go!, on the other hand, is a straight-out karting game in the same vein as the classic Mario Kart and mobile karting games such as Tiki Kart 3D, Shrek Kart, and Sonic and SEGA All Stars Racing. The basic principle of Angry Birds Go! 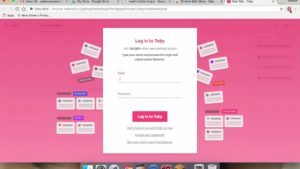 is simple - get around each track as fast as you can. The game rarely gets boring, thanks to the variety of race modes, drivers, cars, courses, and power-ups. 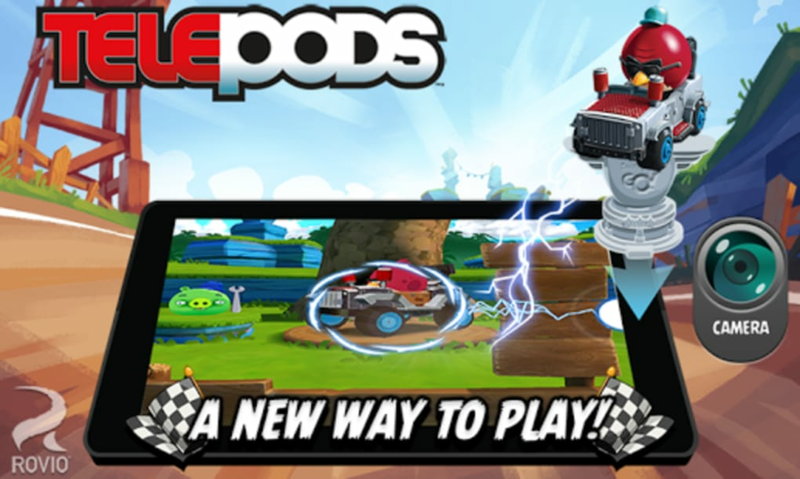 There are even real world toys that can be used with Angry Birds Go!, such as Telepods and a tie-in with Angry Birds Jenga! You start Angry Birds Go! 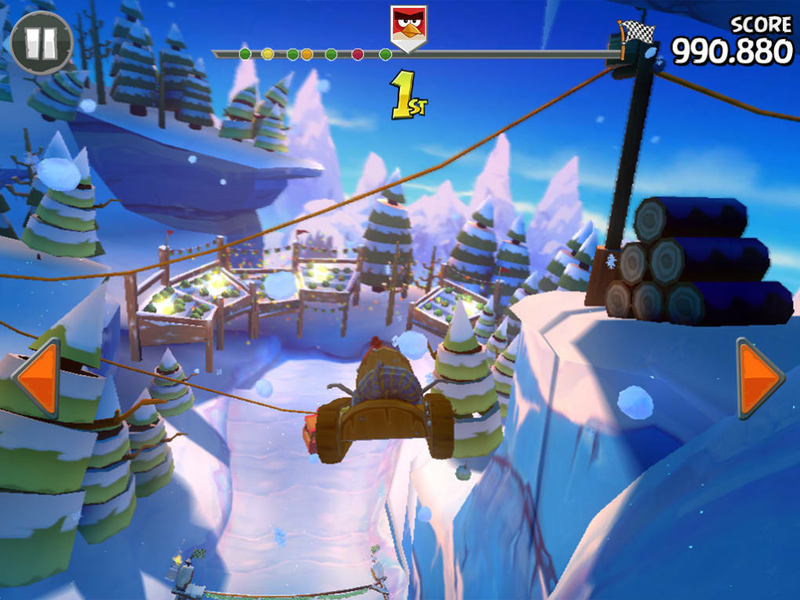 as Red Bird in a basic kart and must play through the various race modes in each stage in order to unlock the new character from that stage and open up the next stage (progressing further opens up new content packs). All of your favorites are in there, including Stella, Bomb and The Blues. You can even play as one of the pigs! The race modes in each stage include: Race (standard race against other characters where you must finish third or above), Time Bomb (finish the race before the bomb goes off), Fruit Splat (splat a given number of fruits before the finish line), Versus (head-to-head with one other character), and Champion Chase (battle against the unlockable character where you must win three times to 'own them). There are five Races, Time Bombs and Fruit Splats per stage. 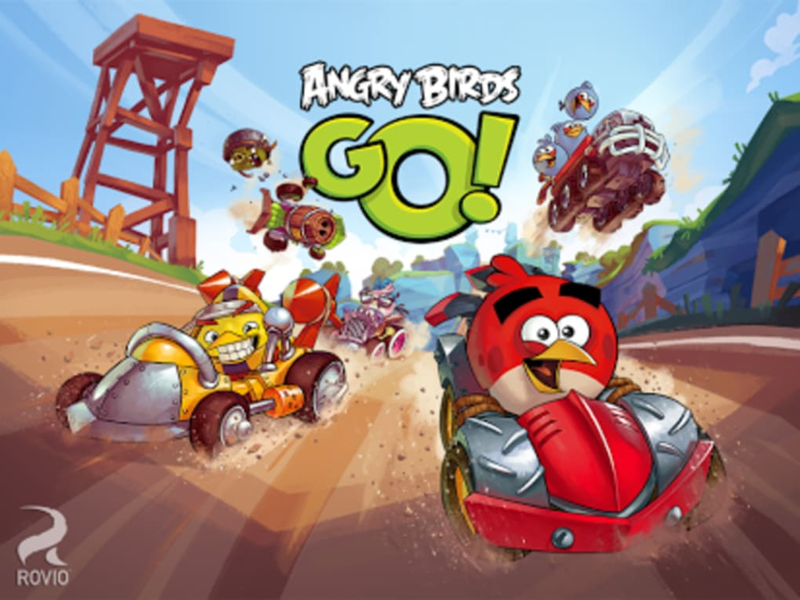 Angry Birds Go now includes an online multiplayer, where you can race other players from around the world, or beat your Facebook buddies, like in Real Racing 3. There's no local multiplayer play over WiFi, though, like in Sonic and SEGA All Stars, nor a 'battle mode' like in Mario Kart. 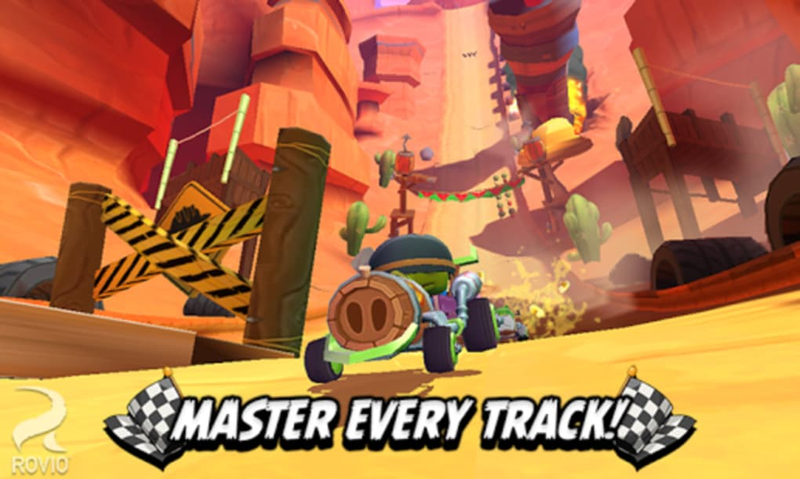 There are also various new challenges to complete once you've finished the races on a particular stage, as well as Facebook integration so you can challenge your buddies' high scores. There's no online or head-to-head multiplayer over WiFi like in Sonic and SEGA All Stars, nor a 'battle mode' like in Mario Kart. The idea of Angry Birds Go! is to collect coins as you race. These can be exchanged for upgrades to your vehicle or new karts. You'll need to keep upgrading since the entry requirements for races demand increasingly high engine power. You'll also accrue gems, which can be exchanged for speed boosts, power-ups, and replenishing energy. 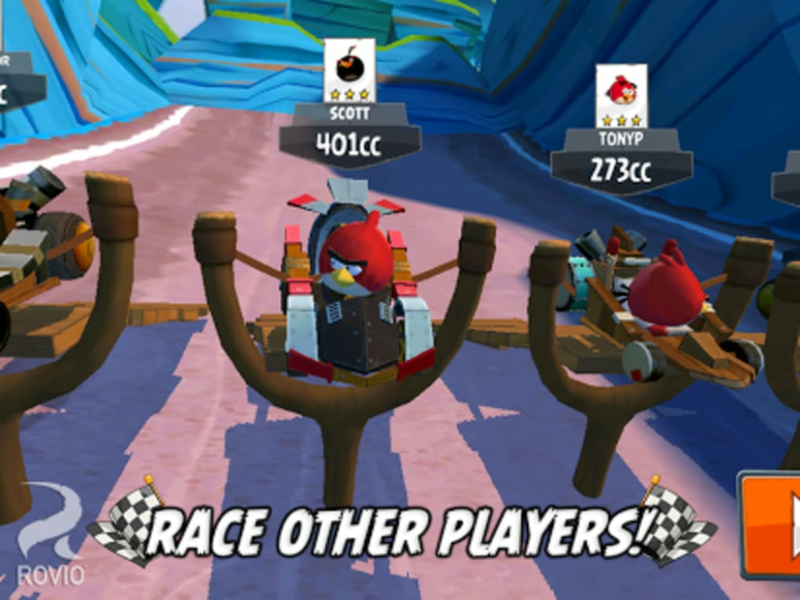 Besides winning gems and coins from racing, Angry Birds Go! 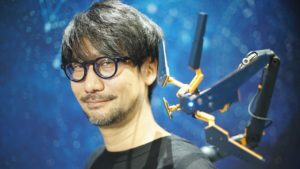 offers you the chance to purchase them through the game. The freemium model of Angry Birds Go! isn't as crippling as you'll find in other big free to play games. 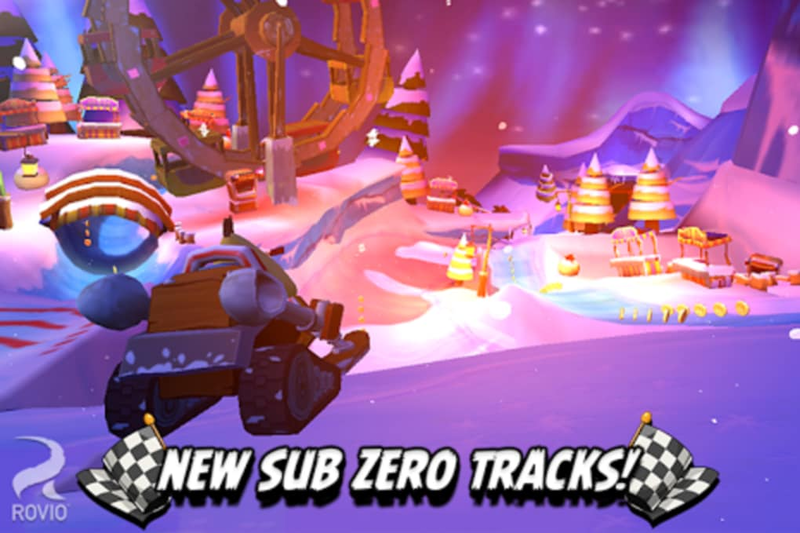 Coins needed for upgrading your kart can be won by replaying levels, but gems are harder to come by. The main use of gems are to rejuvenate the energy levels of your drivers, which run out after a few races. You won't be able to play with a driver unless you wait a few minutes or pay to boost their energy. The waits aren't generally that long, and if you have plenty of characters unlocked it's not so bad. How to play Angry Birds Go! Playing Angry Birds Go! is great fun, thanks in no small part to its simple control system. You can choose between tilt or touch steering, both of which are very easy to use. The cars auto-accelerate and holding the screen will throw your kart into a drift. These simplified controls really lend themselves to the younger market, making Angry Birds Go! a great game for kids. Aside from steering you'll also need to think about various other things to get you round the track in first place. Things that can help include boosters that shoot you forwards when you drive over them, a speed burst button (the effect of which varies with each driver), and various fun power-ups such as catapults, instant repairing, and permanent boost. Angry Birds Go! is the first game in which the Angry Birds appear in 3D. 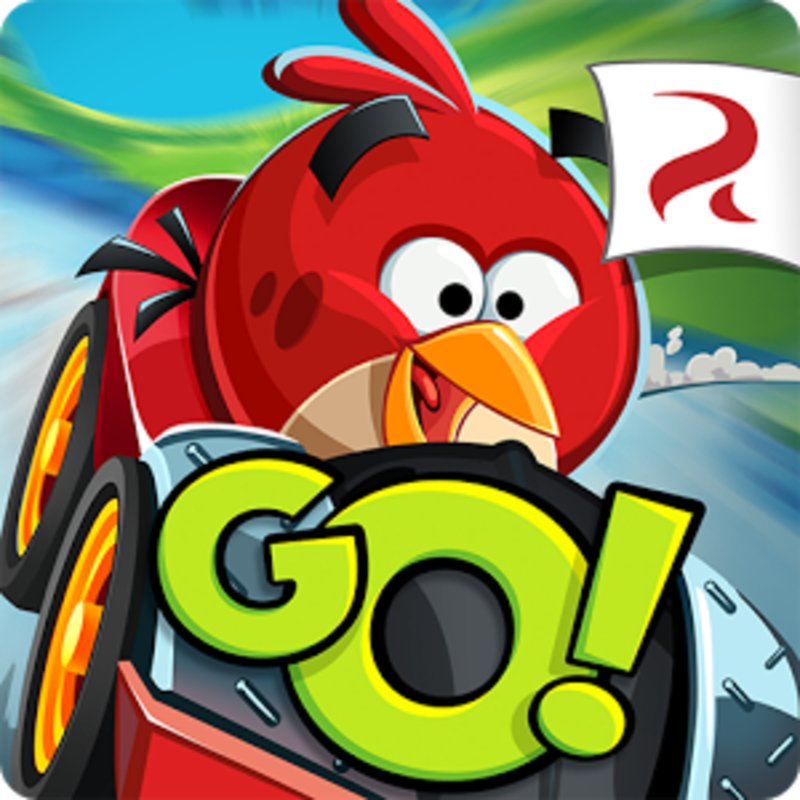 The graphics look fantastic, with a slick cartoon feel that fits in nicely with the fun and frantic image of the Angry Birds brand. The overall presentation is very slick, and Angry Birds Go! 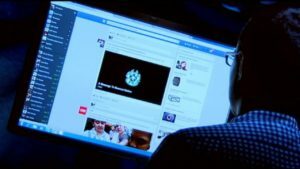 also gives you access to a wealth of video content, including new episodes of Angry Birds cartoons. Angry Birds Go! 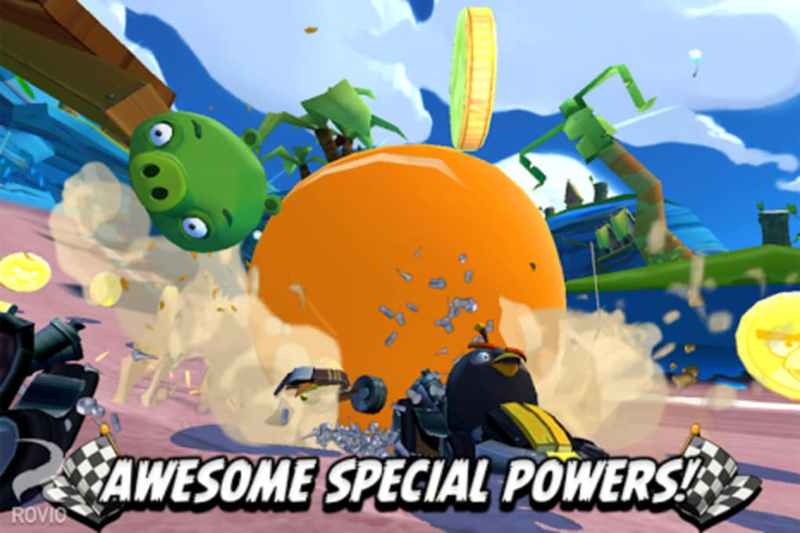 is a fun and slick kart racing game with bags of personality. It's a pity you are often kept waiting, though. The latest update to Angry Birds Go! adds a fun new team multiplayer mode to the game. 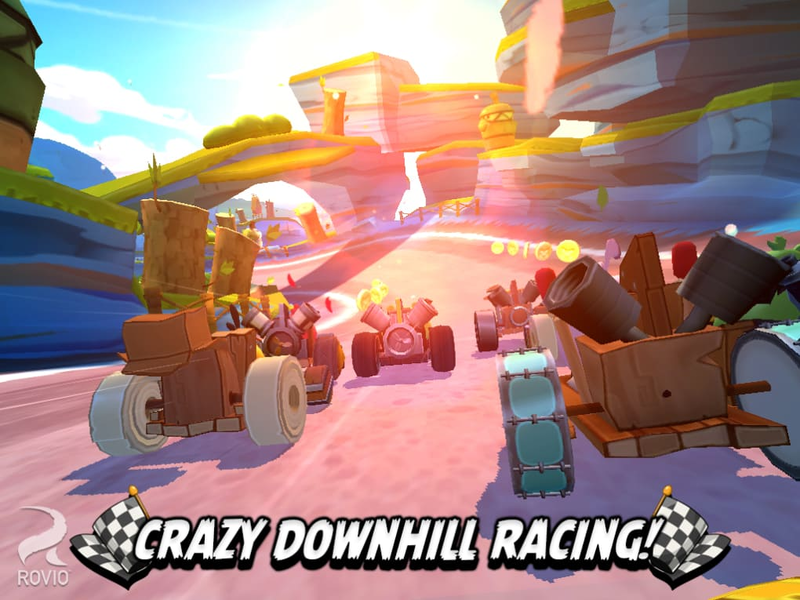 You can get together a crew of friends and hit the track in three-on-three multiplayer races. There's also a new nighttime mode, where you can race your favorite tracks in the dark with your headlights on. User reviews about Angry Birds Go! Your review for Angry Birds Go!